Thanks to its hosting of the European Union’s Conference On Ocean Conservation, the largest aquarium in Europe is in Portugal at the Oceanarium in Lisbon. In Portugal, where 25 percent of the commercial fishing centers around sardines, my choice here isn’t quite right. But sometimes a fish just speaks to you. I sat mesmerized by the Guitar Shark in the huge fish tank. I liked this Guitar Shark. It seemed to be a creature that was comfortable with itself. It glided but not in a show-off manner. 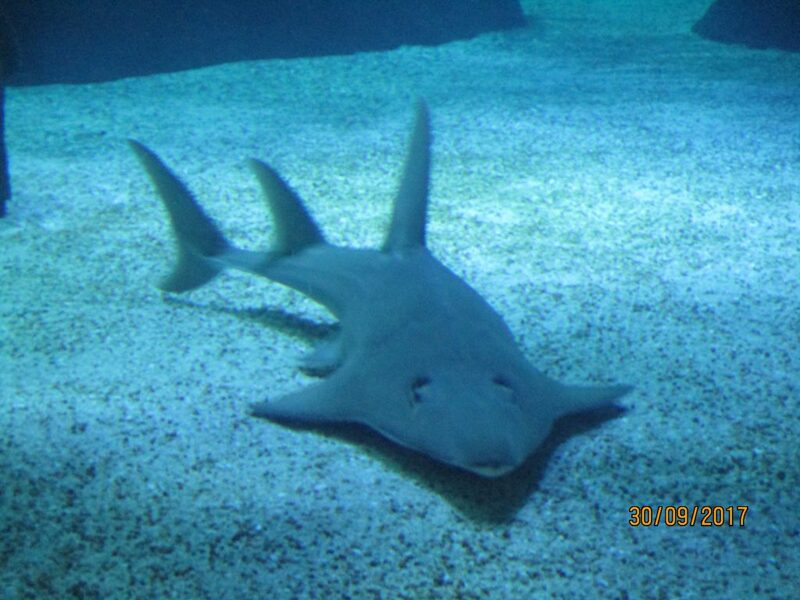 The Guitar Shark seemed quite laid back for a shark and they say they are related to skates rather than sharks. But what’s in a name? Has this type of shark been used for a guitar? Been the model for a guitar. Inspired people to play the guitar? Being a Sponge Bob fan, I’m assuming this shark plays the guitar. There is much classical guitar found around Lisbon. So perhaps this shark plays classical guitar. I feel certain, the shark doesn’t play Fado. I suppose that being in a tank, the shark might be playing the blues. And just what does this shark’s guitar look like? Are barnacles used to tune the strings. Does the shark use a capo? While we contemplated each other for some time, many questions remain.